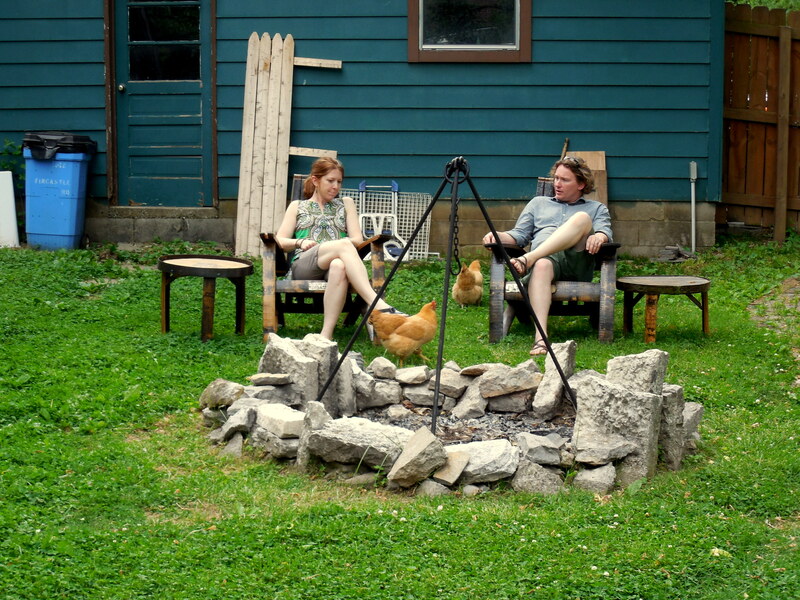 Our ex-neighbors did attain Amanda’s goal of having some chickens. Mark got a dozen fertile eggs from a friend, and they incubated them with a warmer. They hatched a day earlier than they were supposed to . . . . Amanda could hear them peeping inside the shells, so she loaded them in a plastic bin with a rigged-up lightbulb warmer and took them on a business trip with her. They ended up hatching in a Hampton Inn somewhere. The warmer was insufficiently warm, so they didn’t dry off as quickly as they ought to have. Luckily, Amanda had brought a hair dryer on her trip . . . Did you know that it’s not only possible to blow-dry a chicken, but that they also LIKE it (the warmth)? I didn’t, either. Sorry there are no pix of the tiny chicks being blow-dried. The three more recent additions to the family [below] have not, to my knowledge, been blow-dried. They were bought day-old, and guaranteed to all be girls. 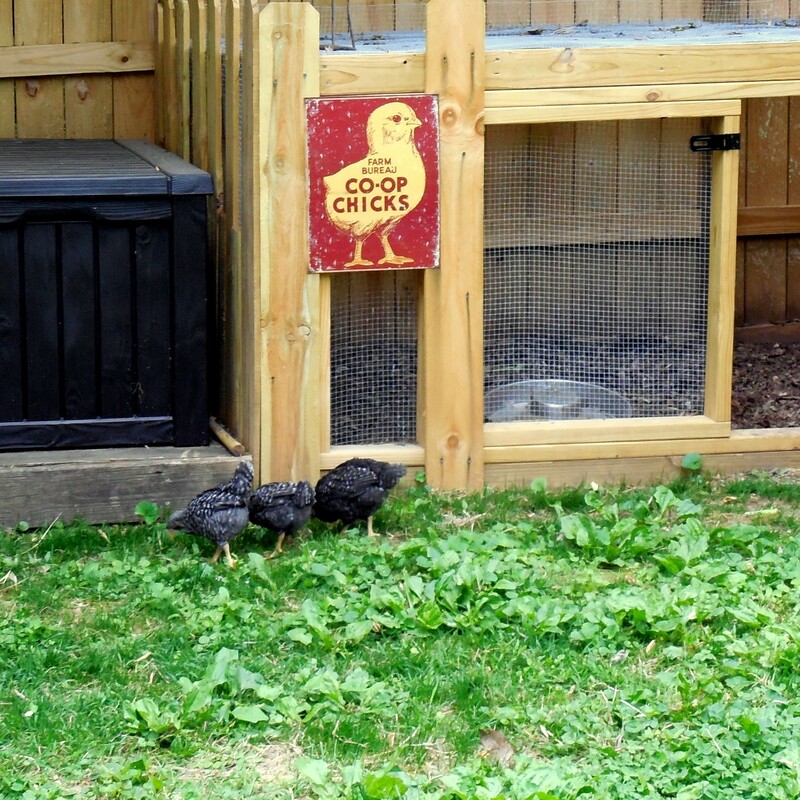 Here are Plymouth Barred Rock pullets, posing outside their little coop, under their picture. Hi, I stumbled onto your blog while researching roses. Just wanted to say thanks. You made me smile and laugh (some tears too). Just what I needed after this past winter in the mountains of PA. Thanks! Glad to know I’ve made somebody laugh besides myself, chuckling at my own goofy jokes. Tell me sometime what roses grow in the mountains of PA — Are you zone 5, then? — I’m interested to know. I’ve got a Marchesa Boccella due to be delivered from Antique Rose Emporium in a week or so. It’s rumored to be hardy to Zone 5 and has been sold under the name Jacques Cartier, so I assume they grow it in Canada.